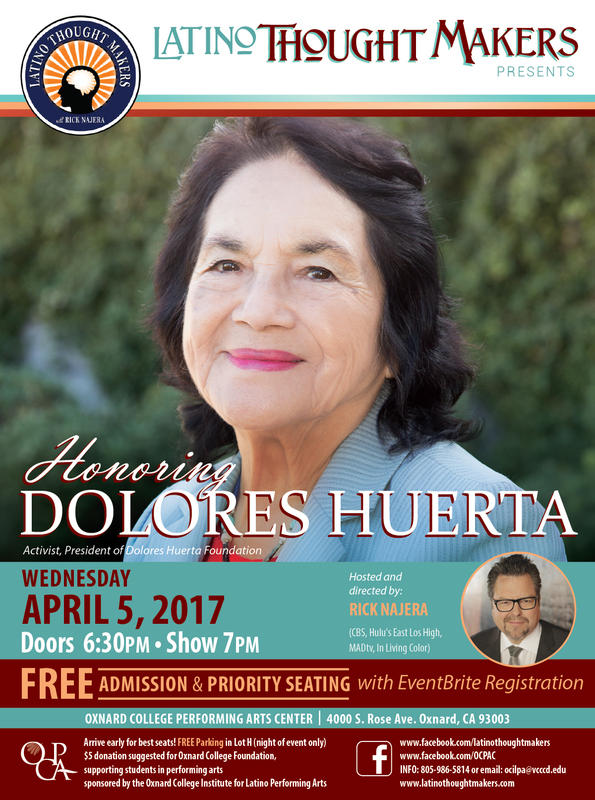 Oxnard, CA [March 1, 2017] In collaboration with the Ventura County Community College District and Oxnard College, Rick Najera’s Latino Thought Makers will honor the labor legend and civil rights activist Dolores Huerta Wednesday, April 5, 2017, 7:00 p.m. at Oxnard College’s state-of-the-art Performing Arts Center, 4000 South Rose Avenue, Oxnard, CA. Latino Thought Makers is a nationally recognized stage series geared toward Hispanic Serving Institutions and showcases the careers and positive success stories of prominent Latinos in Hollywood. The show was created and developed by award-winning writer-director-actor-comedian-playwright and author, Rick Najera, whose also hosts the series. Najera’s portfolio of work spans all forms of entertainment including TV, film, Broadway, radio and internet (Hulu, CBS, NBC, Showtime, HBO, NPR, CNN on shows such as MADtv, Tavis Smiley, East Los High, In Living Color, Latinologues on Broadway and more). Featured guests on the show have included Edward James Olmos, Danny Trejo, Josefina Lopez, Luis Guzman, Esai Morales, Emilio Rivera, Lisa Vidal, Marco Antonio Regil, the family of Cesar Chavez, and more. Featured guest, Dolores Huerta is a labor legend and civil rights activist who founded the Dolores Huerta Foundation (DHF) and co-founded the National Farmworkers Association, that later became the United Farm Workers. Huerta has received numerous awards for her community service and advocacy for workers’, immigrants’, and women’s rights. Among these awards are: The United States Presidential Medal of Freedom, The Eleanor Roosevelt Award for Human Rights, The Eugene V. Debs Foundation Outstanding American Award, and the Orden Mexicana del Águila Azteca, Mexico ’s Orden of the Aztec Eagle Award and nine honorary doctorates from Universities throughout the United States. As a role model and living legend to many, Huerta has become a leader in efforts to improve the Latino, labor, and LGBT communities. “Dolores Huerta is an iconic national figure and civil rights leader. We are honored to have her visit Oxnard College as one of the premier Hispanic Serving Institutions in California,” said VCCCD Chancellor Bernard Luskin. “The Board of Trustees extends a warm welcome to Dolores Huerta. We are proud to honor her as part of the next Latino Thought Makers showcase,” stated Board Chair Bernardo Perez. Latino Thought Makers Honoring Dolores Huerta will take place on Wednesday, April 5, 2017, at 7:00 p.m. at Oxnard College, Performing Arts Center, 4000 S. Rose Ave, Oxnard, CA 93033. Doors open at 6:30 p.m. Tickets are FREE and the event is open to the public with registration on EVENTBRITE. Parking is FREE in Lot H on night of event only. A $5 donation is suggested to benefit the Oxnard College Foundation supporting student scholarships in the arts. The season finale of Season 4 of Latino Thought Makers takes place on Wednesday, May 3, 2017, presenting “Women Who Rule”. The 2017-2018 Season 5 of Latino Thought Makers will be announced soon. By the way, PBS is supposed to air a special on Dolores’s life I heard, do you know when that might be?